Drifting, meandering and aimless wandering..the perambulations and musings of Mr H in London, Cambridge and elsewhere. Just before an abandoned pub, Temple City, a left turn. Scanning for the name of the street, out of the corner of my eye I notice the the sign at almost ground level. 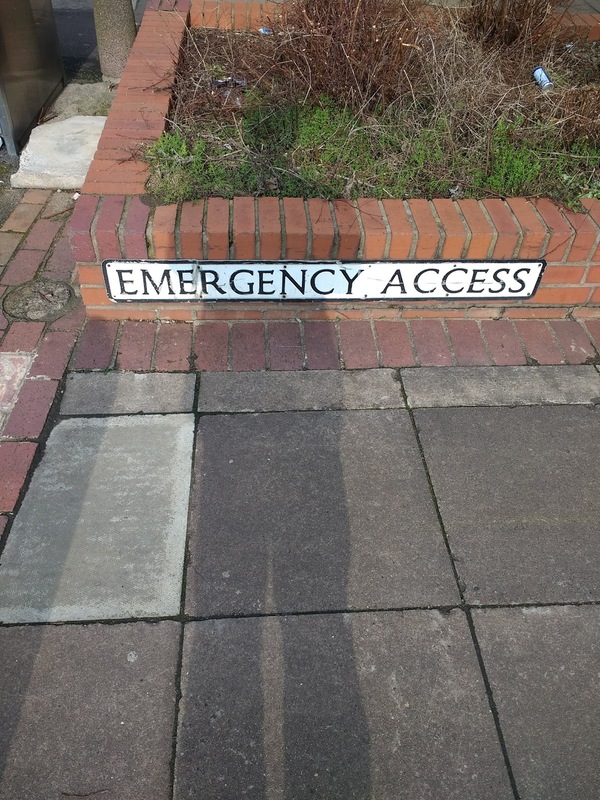 It comes into focus..'Emergency Access'. An odd name for a street. Or an odd position and design for something signposting emergency access, well disguised from approaching ambulances, police cars or fire engines. Whether it allows access to an emergency or escape from one, or has some other meaning, it probably remains unnoticed by most, even those on foot. Time was against me, prohibiting an instinctive left turn. I carried on past the pub, one of many closed or abandoned in recent years in the UK. Another type of emergency.